As I mentioned in previous posts, I attended the British Asian Fashion Week preview show. There were nine designers in total, previewing their collections in anticipation for British Asian Fashion Week in September. The show focused on the fusion between Eastern and Western fashion, showcasing each designers unique style. Below is a picture of the venue, it encapsulated the theme of the show beautifully and as I was front row, I was lucky enough to see the detail each designer had put into their work. And let me tell you, the pictures will not do most pieces justice at all! This collection kicked off the show with a wide variety of styles. 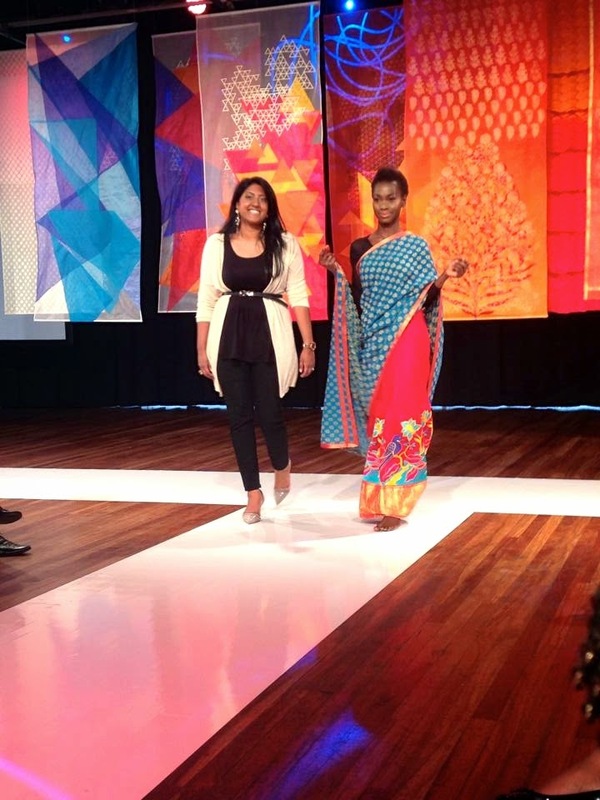 The pieces ranged from traditional sarees to dresses in indian fabrics. It was an amazing start to the show! This collection was an amazing compilation of traditional sarees. The colours were so vibrant and the collection definitely inspired me! I really loved the blue suit in the last picture. NG Sarees' collection was absolutely stunning (I may be a little biased as I am currently consulting for the company but just see for yourself!) 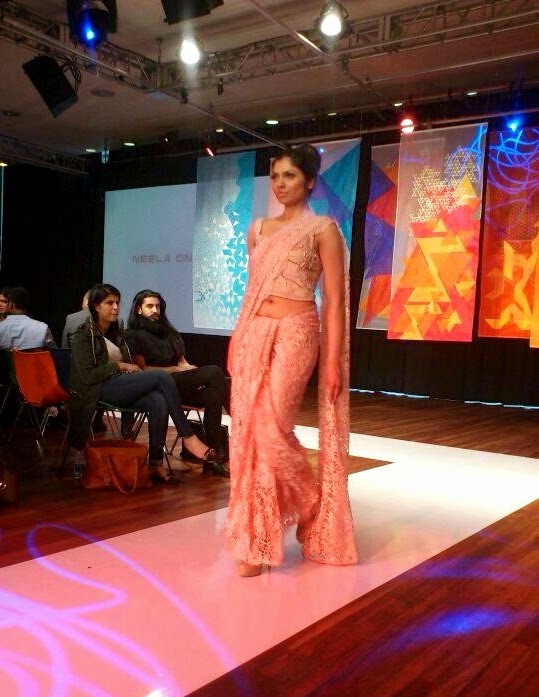 The designer had created a beautiful modern twist on each saree. Also the use of pastels and bright colours put me into such a summery mood. I fell in love with the lace one below... it's so beautiful and elegant... and I'm just a complete sucker for lace. For sure my favourite piece from the show! With the amazing ruffles, beautiful embroidery and impeccable detailing, each piece would have been an amazing choice for a wedding dress. Looking closely at each piece, the details are just stunning! This collection had a gorgeous range of pieces which featured some stunning embroidery and rich metallics. I love the use of the crop tops, it's done in such an elegant way. Props to this designer for being the only one showcasing any mens pieces. It brought an interesting balance to the feminine, elegant pieces that had come previously. I adore the use of rich colours in this collection. As well as the beautiful overcoats. This collection was simple and elegant. I loved the piece in the picture below, the detailing on the top is divine and the dark colours make the outfit different to the rest of the collection. This collections use of colour was beautiful, the pieces stood out in such a bold way yet had such a feminine flair to them. I also loved the use of the florals within the sarees, as it's one of my favourite trends this season! This collection was rich and elegant. I especially loved the piece in the first picture below, the ruffles were SO gorgeous, the way they moved as the model walked was so graceful. It's definitely inspired my future wedding dress ;) and don't even get me started on the beautiful embroidery! Thanks for reading and I hope this post inspired you! Shout out to everyone involved in the show! They all did a wonderful job. Great outfits, I love the second one. Come by and check out my blog, if you like it, I would love it if you followed me.